For the first time travelling to the U.S. to a volleyball tournament, the Legacy “family” had a great adventure together on the Family Day weekend February 14-16th. 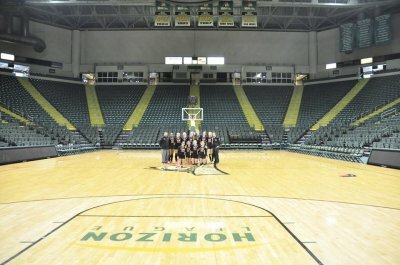 A little intimidated by the size of the Wright State University Athletic Centre and the 24-team tournament, and the few more very tall and muscular 14-year olds than they typically face at home, the girls took some time to get comfortable and show their best play consistently. Legacy played a decent first match vs. Maverick Elite (of Ohio), but lost 21-25, 18-25. The second match vs. Dayton Juniors was very exciting after a slow start losing the first set 16-25, with a thrilling win in the 2nd set 25-18, but then Legacy gave up the match in the third set 11-15. Next was Tri-State Elite (from Cincinnati/Northern Kentucky), with a scary start but a strong comeback in the first set (19-25), but giving up the match in the second set 17-25. The last match of Saturday was vs. the intimidating Cincinnati Classics Red, who with their stronger and more consistent skills & teamwork, beat Legacy 25-12, 25-6 – a rough note to end the day on. An early Sunday morning start found Legacy facing Elite VBTC (of Columbus, Ohio) – a tough way to start the day, losing 17-25, 16-25. The last match of the tournament was vs. Dayton Juniors – the one team Legacy had won a set against on Saturday. Legacy found their groove and showed how they do it, dominating and winning in two sets – finally a win, and a show of their great abilities to the Americans! Legacy finished the tournament tied for 5th in the Bronze division – a great and challenging experience, and a win to be proud of to end the tournament. All that and a great little holiday in a lovely hotel next to some great shopping & restaurants made for a fun Family Day weekend adventure! Another medal for 13U Durham Attack Heat! Girls 14U Legacy Medals in Every 14U Tournament this Season!